Once everyone is back from their summer holiday, Christmas will come around before you know it. Here are our top ecommerce tips for getting ready for Christmas. Mine Your Data - Your most valuable resource for deciding what you should do next Christmas is data you have from last year. Look at who bought from you and when in previous years. Use this data to build segments for your email campaigns. Review what products you sold most of last year. Can these categories be expanded? Are there any categories that didn't sell well? Additionally, review which promotions worked the best; what times of year and what types of promotion were they? Embrace PPC - You might not normally use PPC but at Christmas it can be a great way to cut through the competition and boost traffic and sales. Customers are more likely to convert at Christmas which means better margins than the rest of the year. Google Shopping feeds, Remarketing Lists and image ads can take time to get right, especially if you have to go through external developers and designers so give yourself plenty of time to set these up. Optimise Mobile & Tablet - Sales made with mobile phones last Christmas grew 14% compared to 2015 and are set to keep growing. We would hope that everybody has a responsive mobile template by now, but are you doing everything you can to make it easy to buy from you on mobile? Adding simple payment solutions like Paypal can give your conversion rates a real boost. Improve Conversion with Plugins - Basket Abandonment functionality and review software, like Feefo or Trustpilot, are proven to improve conversion rates. We've seen great results with both types of software. If you want to get the most out of these improvements before Christmas, you're going to have to get coding and testing soon. Site Speed, Code Freezes & Hosting - Slow speed or site crashes can cause huge revenue losses in the lead up to Christmas. We recommend a 'code freeze' in Q4 to prevent any unexpected bugs and changes taking down the site during peak business. It’s also worth checking with your hosting providers to see how easy it is to scale up your hosting capability during peak times. 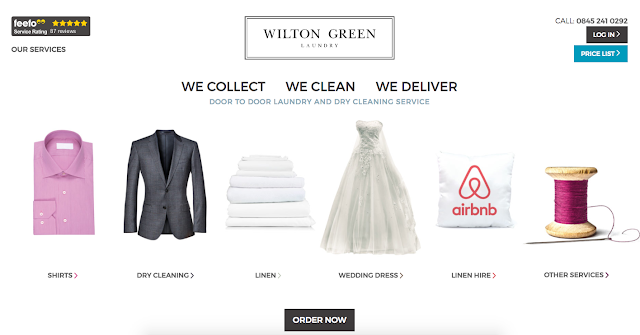 We've written a case study of some work we've been doing with Wilton Green Laundry and Dry Cleaning. You can see it here. It can be hard to communicate with designers so that you get exactly what you want. This great article outlines how to write an effective design brief. From Quba, here. From Ecommerce Masterplan, this great podcast interview gives great insight into growing a multimillion pound business. See here. How are you innovating with your delivery options to compete with the biggest stores? Tesco is introducing one hour delivery. From Business Insider, here. From Bloomberg Technology, Amazon is joining companies like Stitch Fix and Trunk Club and entering the subscription box market. An interesting view here of how the biggest retailer of them all is getting serious about clothing - here. The real trick to boosting conversion rates is to get your proposition right. This interesting article offers some thoughts on how to position your brand to drive more sales. From Econsultancy, here.